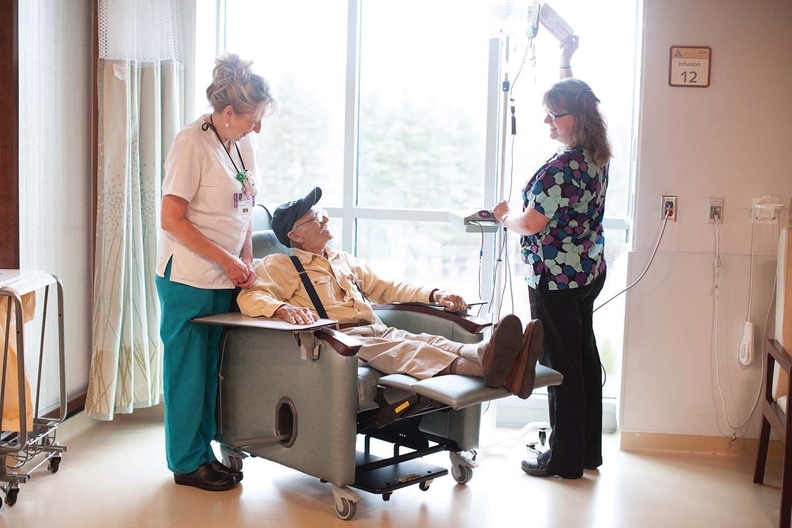 A patient receives treatment in an infusion suite at Berkshire Medical Center. The facility has teamed up with Dana-Farber Cancer Institute in Boston. The CMS announced Friday that it will cover diagnostic laboratory tests using gene sequencing technology for Medicare cancer patients. The CMS said the tests — called next generation sequencing — can help patients and their oncologists make better treatment decisions as well as help more patients enroll in clinical trials. Patients with recurrent, metastatic, relapsed, refractory or stages III or IV cancers will be eligible to get the tests covered under Medicare, according to the agency. "We want cancer patients to have enhanced access and expanded coverage when it comes to innovative diagnostics that can help them in new and better ways," said CMS Administrator Seema Verma in a statement. "That is why we are establishing clear pathways to coverage, while at the same time supporting laboratories that currently furnish tests to the people we serve." The CMS' decision to cover such tests comes shortly after the FDA's recent approval of Foundation Medicine's genomic profiling test called FoundationOne CDx. The CMS worked with the FDA to review the effectiveness of the test. FoundationOne CDx can detect genetic mutations in 324 genes and two genomic signatures in any solid tumor. The CMS said it will cover other similar tests after FDA approval.